A subscription to the component database gives you access to exclusive datasheets compiled by Andrea Butje and Robert Tisserand. Each datasheet includes a molecular structure illustration, chemical family, therapeutic properties, medical actions, safety concerns, notes and detailed references. View a sample datasheet for Thymol. Search the essential oil components. Search by chemical family or specific health concern (therapeutic property). 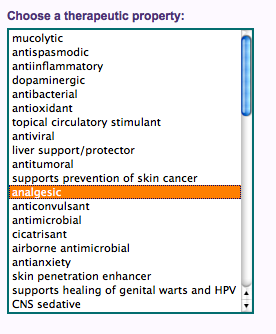 Select multiple therapeutic properties and/or chemical families to create your own custom search. Search results turn up organized lists of components. Click on each component to view the component datasheet.